Educational visits are at the heart of the Regional Park's aims and objectives, see how we can help your children achieve at the different levels. All age groups are welcome at Clyde Muirshiel and we can adapt topics to suit those in the Early Years right through to those at Third and Fourth Level. Teaching methods are also flexible and can be adapted to suit those with additional support needs. All of our content and activities contribute towards your pupils to attaining the four capacities and learning outcomes as set out by a Curriculum for Excellence. The Ranger Service can also assist groups such as girl guides, boy’s brigade and individuals such as Duke of Edinburgh participants who are looking to learn or spend time out of doors. During the Summer holidays each Centre runs a programme of family orientated education events. These are usually very fun days and involve activities and walks with the Rangers. See our Events page or pick up a Summer ‘What’s On’ guide at your local Centre for details. Countryside Rangers can assist your school’s achievement of the Eco-School award enabling your pupils to become responsible citizens. Rangers can promote messages of conservation and even work with your school’s Eco-committee to promote links and increase contact with the local community. We can help enhance wild areas in your school grounds, and help teach pupils how to maintain this area themselves. Looking after these areas can help increase biodiversity, encouraging plants and animals into the area, which pupils can then learn about. This will help them not just in school but will give them knowledge and understanding of their place in the environment they can take forward beyond the classroom. Please contact us if you think we could help your school. 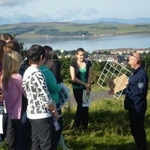 For more information on Eco-Schools, visit the Eco-Schools Scotland website. To book a visit with your school or arrange for a ranger to come to you, please contact the Ranger Service to discuss you requirements. Remember all Countryside Ranger Services are FREE. Don’t see what you are looking for? Please Contact Us to discuss your classes’ learning objectives and outcomes. What we can do with nursery and primary one children. What we can do for younger primary children working towards the first level in the outdoors. For upper primary children, working towards the second level.